At Overhead Crane & Conveyor Services, we have the knowledge and experience to design, build and install crane systems in challenging environments. 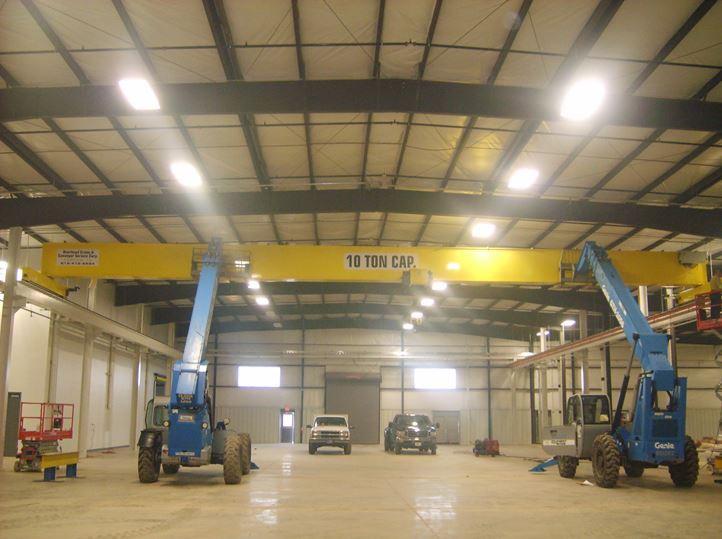 For the project highlighted here, our team was tasked by A & K Construction from Paducah, KY with providing a ten ton crane system for a German customer in the automotive industry. The customer, who had successfully contracted us before, already had a certain budget set aside for the project and a specific minimum hook height requirement for the system. At the job-site, we met with the owner of the construction company and their engineer for the project to evaluate the site and determine the changes that would be needed to support the crane system. To meet the customer’s requirements, it was determined that an independent support system would need to be installed 5′ from each side of the 84′ bay, making the span 72′ for the crane system. We also had to take uneven floors into consideration. The design would require columns that extended from the floor on special footers to the main beams above. Our engineer designed concrete footers that extended from the main support beams of the building. We designed seats for the existing columns that were used to support the runway system and used software produced by the American Institute of Steel Construction, or ASIC, to select the appropriate runway beam for the specified loading requirements. After the design process was complete, our expert staff (including a certified welder) fabricated and installed the entire crane system. Functional and load testing were performed to further confirm conformance of the system to all performance requirements. Not only was the system built to the customer provided specifications and within the appointed budget, it was installed in just nine weeks--three weeks ahead of scheduled. Our customer was pleased with every aspect of our work, including our design, manufacturing, and installation, and has returned to us for additional projects. For additional details about this custom overhead crane fabrication project, see the table below,or contact us directly. Lift Height: 19′ 8″ Span: 72 ft.